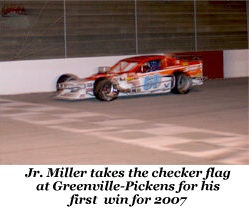 GREENVILLE, S.C. (April 7, 2007) – Junior Miller has built the reputation as “The King of the Southern Modifieds” by letting his fellow drivers jump out to big early leads only to stalk them down in the closing laps and coming away with the victory. That was exactly the case Saturday night in the An American Revolution 150 at Greenville-Pickens Speedway, as Miller rode around in the top five for the majority of the race behind the dominant car of Matt Hirschman. Hirschman ran out front from lap five until lap 129, when Miller drove underneath him to take the lead away. 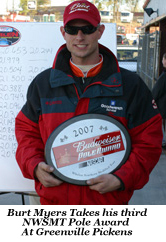 Miller led the rest of the way en route to his 10th career NASCAR Whelen Southern Modified Tour victory. After Miller took the lead, Hirschman fell back to second until he spun coming off the fourth turn after contact with Tim Brown. 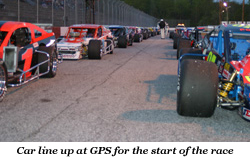 Hirschman's late spin set the stage for a green-white-checkered finish with Miller holding off Brian Pack for the win. 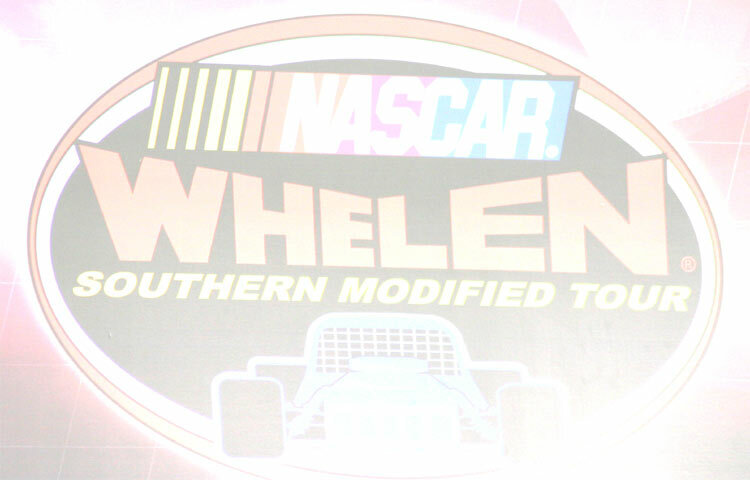 Miller's win allowed him to take over the NASCAR Whelen Southern Modified Tour point lead by 28 points over Burt Myers. L.W. 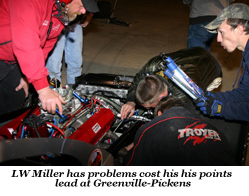 Miller, who held the point lead coming into Saturday night's race, was knocked out of the race on lap 45 due to electrical problems. For Pack, his runner-up effort tied a career best NASCAR Whelen Southern Modified Tour finish from last year at Virginia's Motor Mile Speedway . Brown wound up third, followed by last week's winner Andy Seuss and Brandon Ward. Burt Myers, Jason Myers, Chuck Hossfeld, Bobby Hutchens and John Smith rounded out the top 10. Hirschman spun after contact with Brown on lap 147, necessitating the overtime finish. Hirschman wound up 11th, the last car on the lead lap. 1. 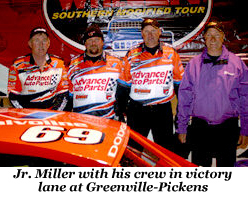 (4) #69 Junior Miller, Pine Hall , N.C. , Dodge, 154 laps, 64.004 mph, $2,000. 2. (8) #81 Brian Pack, Walkertown , N.C. , Chevrolet, 154, $1,700. 3. (5) #83 Tim Brown, Cana , Va. , Chevrolet, 154, $1,125. 4. (16) #70 Andrew Seuss, Hamstead , N.H. , Chevrolet, 154, $1,050. 5. 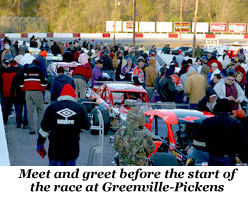 (18) #42 Brandon Ward, Winston-Salem , N.C. , Chevrolet, 154, $1,350. 6. (2) #1 Burt Myers, Walnut-Cove , N.C. , Chevrolet, 154, $1,100. 7. (3) #4 Jason Myers, Walnut Cove, N.C., Chevrolet, 154, $750. 8. (7) #79 Chuck Hossfeld, Ransonville , N.Y. , Chevrolet, 154, $690. 9. (14) #14 Bobby Hutchens, Lexington , N.C. , Chevrolet, 154, $590. 10. (15) #25 John Smith, Mount Airy, N.C., Chevrolet, 154, $550. 11. (6) #59 Matthew Hirschman, Northampton , Penn. , Chevrolet, 154, $525. 12. (12) #2 George Brunnhoelzl, Babylon , N.Y. , Dodge, 152, $525. 13. (21) #76 Jason Trinchere, Sherrills Ford , N.C. , Chevrolet, 151, did not return, $485. 14. (13) # 7 Thomas Stinson, Chester , Va. , Chevrolet, 151, $460. 15. (22) #44 Greg Butcher, Mocksville , N.C. , Chevrolet, 150, $445. 16. (19) #26 Wesley Swartout, Stroudsburg , Penn. , Ford, 149, $430. 17. (24) #98 Rich Kuiken, Jr., Staffordville , N.J. , Chevrolet, 146, $420. 18. (23) #17 Brian King, Burlington , N.C. , Chevrolet, 135, engine, $410. 19. (17) #02 Buddy Emory, Petersburg , Va. , Chevrolet, 119, engine, $400. 20. (20) #31 Gene Pack, Myrtle Beach , S.C. , Chevrolet, 118, suspension, $390. 21. (9) #30 Earl Baker, Winton-Salem , N.C. , Chevrolet, 116, accident, $380. 22. 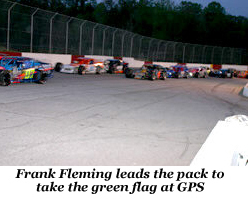 (1) #07 Frank Fleming, Mount Airy , N.C. , Pontiac , 103, suspension, $360. 23. (11) #53 Johnathon Brown, Winston-Salem , N.C. , Dodge, 67, accident, $340. 24. (10) #36 L.W. Miller, Mooresville , N.C. , Pontiac , 44, electrical, $320. Lap Leaders: B.Myers 1-3; F.Fleming 4-5; M.Hirschman 6-129; J.Miller 130-154. Standings: (1) Jr Miller, 490; (2) Burt Myers, 462; (3) Tim Brown, 457; (4) LW Miller, 441; (5)Brandon Ward, 402; (6) Brian Pack, 394; (7) George Brunnhoelzl III, 389; (8) Bobby Hutchens, 378; (9) Jason Myers, 376; (10) Wesley Swartout, 373.